So this is technically a side dish, but fair warning you might end up eating it all as the main part of your meal. 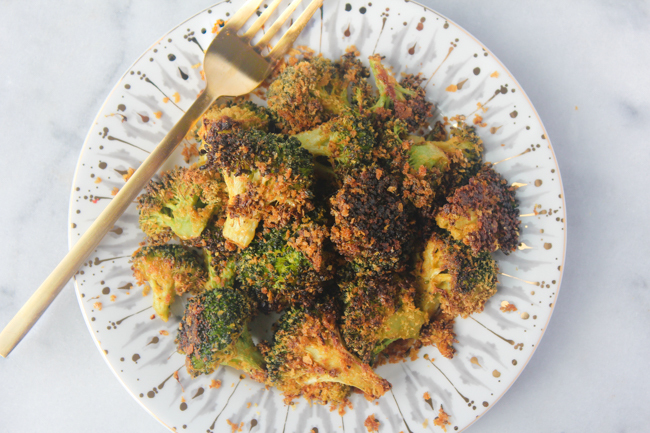 When I decided to post this recipe, I asked my boyfriend if I should pair the broccoli with a grain or some beans to make it into a full meal, but he felt strongly that the beauty of this broccoli is in its simplicity, and I couldn't agree more. 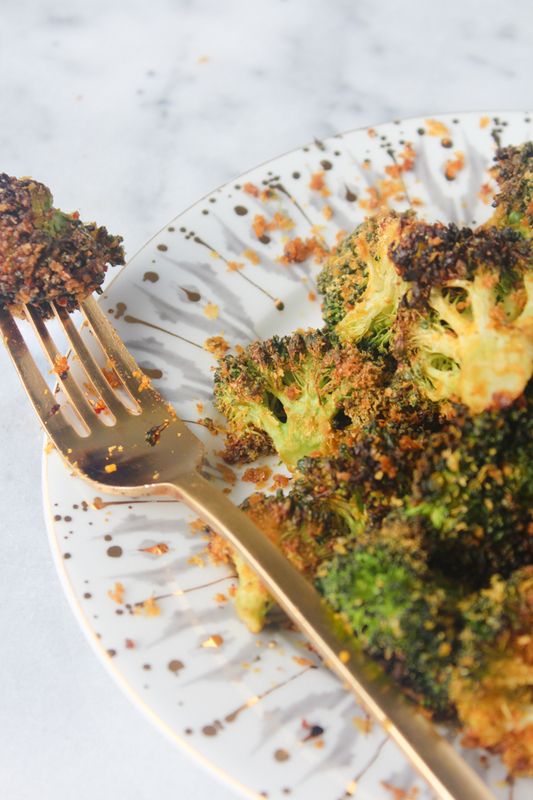 Just the right amount of olive oil, a dash of nutritional yeast, and ample time in the oven transforms this broccoli into crispy, rich, cheesy amazingness that's highly addictive. If you're wondering what nutritional yeast is, head over to this post for baked mac and cheese to find out. 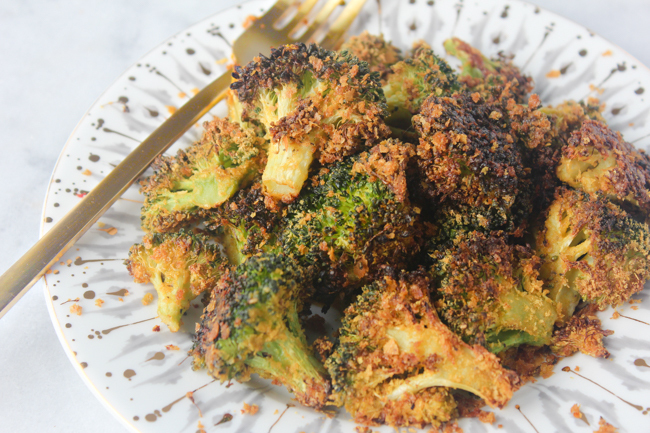 On second thought, this roasted broccoli would be the perfect accompaniment to the mac and cheese, so head over to this post anyway to put together your next delicious dinner. Although this dish feels indulgent, it's still very nurturing. Broccoli is high in fiber, protein, and is a powerful antioxidant rich in Vitamin C that protects against immune system deficiencies, cardiovascular disease, and even fights skin damage and reduces wrinkles. 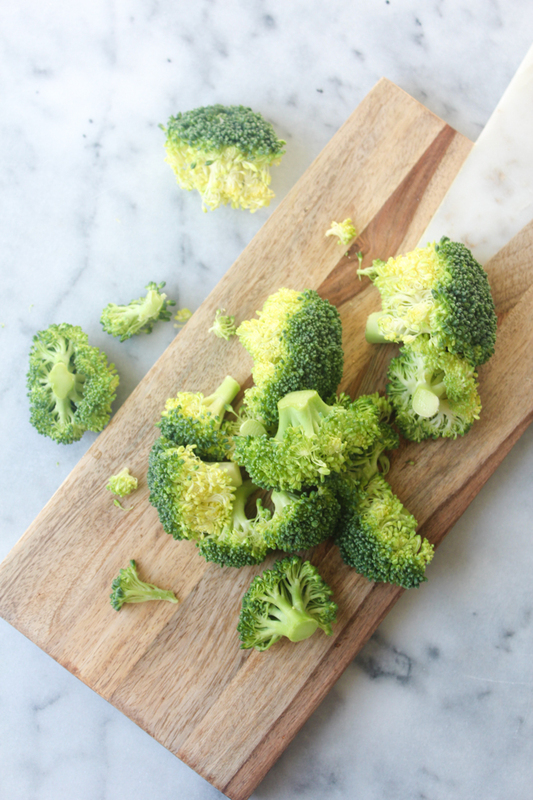 People often think of oranges or lemons when they think of Vitmain C, but broccoli actually provides 81 miligrams in just one cup, which is more than you need in an entire day. Broccoli is also extremely high in sulphoraphane, which is currently being extensively studied for its ability to fight cancer. So basically, there's a reason your parents tricked you into eating broccoli when you were little by telling you they were mini trees and you were a dinosaur...No? Just me? It's because it's super healthy and this recipe is the most delicious way to prepare it. No coercement necessary. - Preheat oven to 425 degrees. 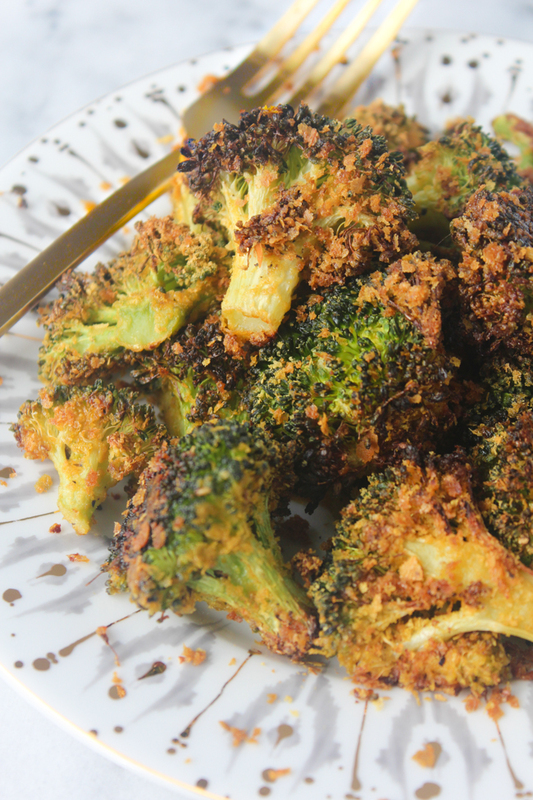 Place broccoli on a baking sheet and drizzle with two tablespoons of olive oil. Sprinkle with salt, pepper, garlic powder, and one tablespoon of nutritional yeast. 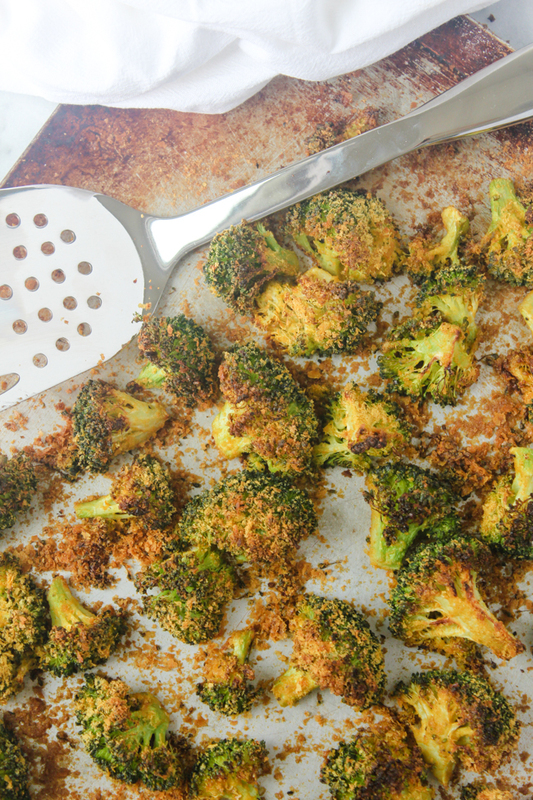 Mix together with a spatula to evenly coat broccoli in oil and nutritional yeast. Spread broccoli back into an even layer. - Drizzle broccoli with the remaining tablespoon of olive oil and then sprinkle on the remaining tablespoon of nutritional yeast. Roast in the oven for about 15 - 20 min (do not stir midway) until slightly blackened and crispy, but still tender. Enjoy immediately. Thanks so much love! Broccoli really is so good for you and tastes incredible, especially prepared like this. Thanks for reading! Looks so yummy! Need to try this! Yes! It so good. Let me know what you think! This seems so delicious! Also, sidenote, your tableware is beautiful! It is super delicious! And thank you! The plate is from Anthropolgie and the flatware is West Elm. I couldn't find a link to either online but they have similar items! It is quite new for me. I will use this recipe for my tomorrow dinner.